Review: The Tiger Who Came To Tea. (touring) Curve Leicester. – East Midlands Theatre. Review: The Tiger Who Came To Tea. (touring) Curve Leicester. 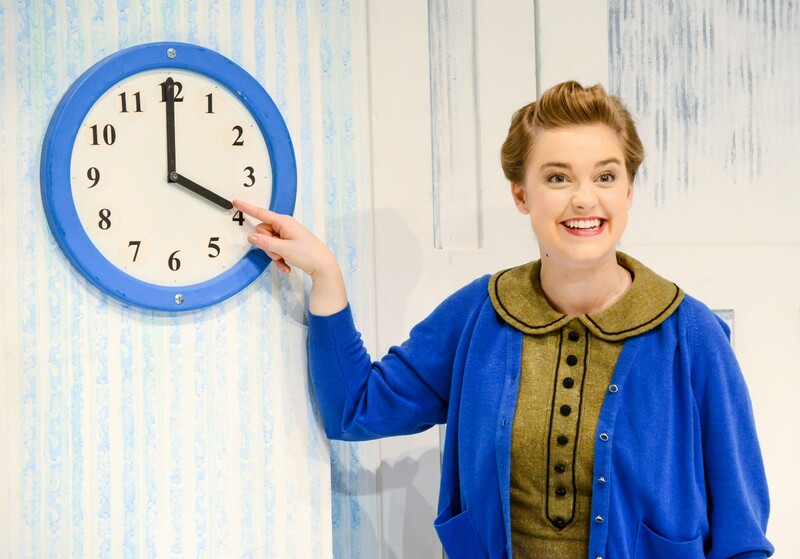 Currently playing in the Curve Leicester studio space is the Olivier Award nominated The Tiger Who Came To Tea, a musical play adapted and directed by David Wood and designed (set and costumes) by Susie Caulcutt. The assistant director and choreographer is Emma Clayton. The stage story is extremely faithful to the popular children’s classic by author Judith Kerr and totally absorbing and entertaining for children 3+ and their parents. The cast of three work their lovable socks off in just under an hour of story-telling. 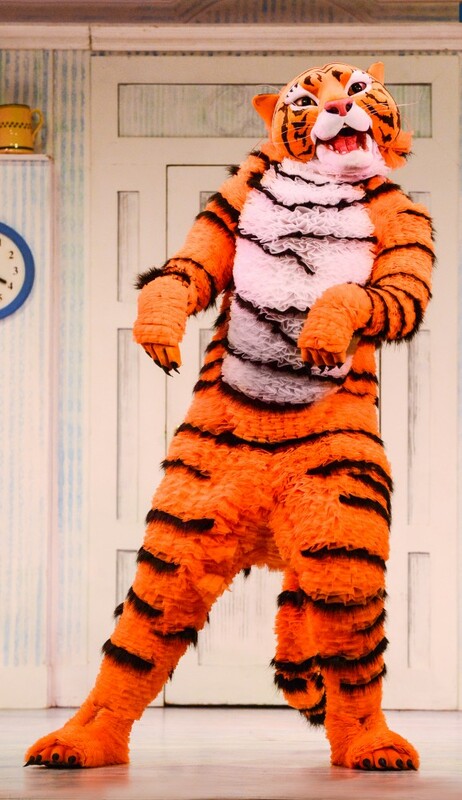 With a mixture of lively movements, repetition, song, humour, dance, daily routine situations that the children in the audience recognise, plus the magic of the friendly (and very hungry) tiger, the cast totally earn their stripes. We are lucky enough to have youthful actress Abbey Norman who played Sophie in the original production in 2008 in this show. 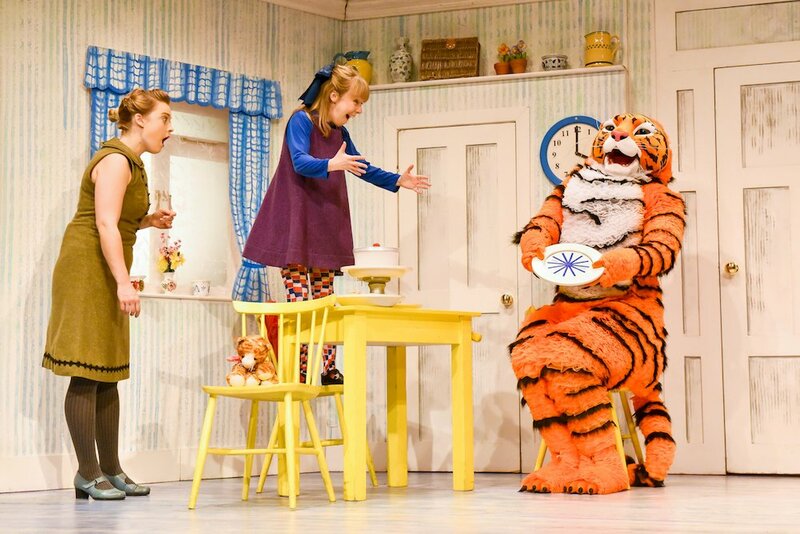 Norman gives a winning performance as the little girl Sophie in love with the lovable tiger. Her utter enthusiasm in the role is contagious! Harry Howle is probably the busiest actor on the stage playing four energetic roles as Daddy/Milkman/Postman and the tiger itself. Ashley Tucker is Mummy to Sophie and one with whom the youngsters in the audience fully engage. With all three performers there is continuous engagement and participation with the audience. Their characters appear as if they have just sprung from the pages of Judith Kerr’s beloved book. The song and dance routines choreographed by Emma Clayton are well actualised and blend seamlessly with the story-telling. Musical director Peter Pontzen’s musical arrangements add much to the show’s charm. There are quite a few surprises in this show, items appearing and disappearing before our eyes and even the little ones enjoy the magic of this. 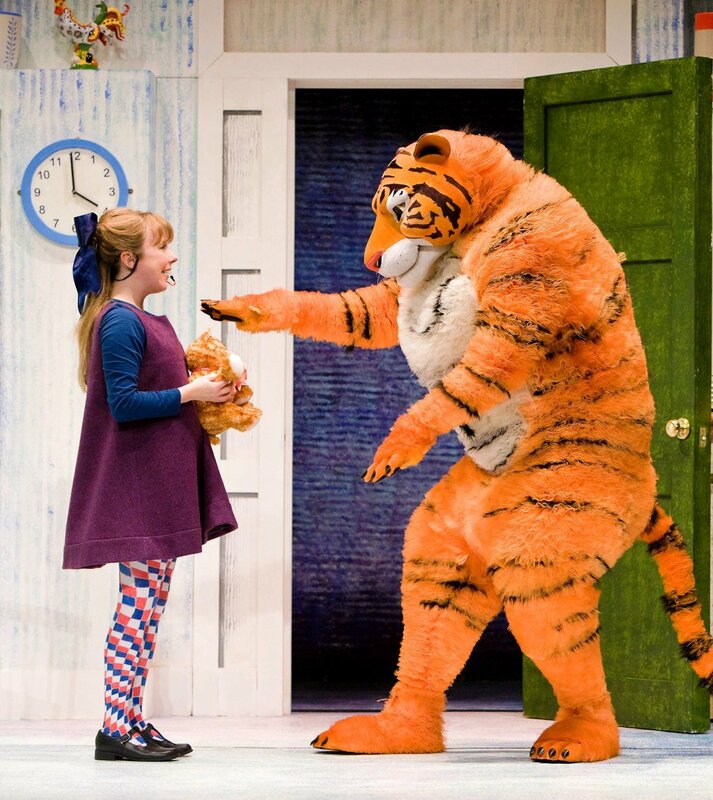 Overall, The Tiger Who Came To Tea is the perfect show to introduce the little ones to the magic of live theatre. No doubt they will all go away hoping for a surprise ring on the doorbell at home and an orange striped furry paw to appear, followed by the rest of the adorable dancing and very gentlemanly tiger! Note to parents: Just make sure your cupboards and fridge are very full. That tiger is very hungry! 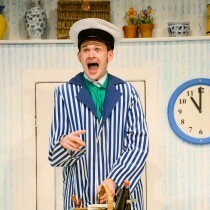 The Tiger Who Came To Tea runs at Curve until Fri 7th July. Review: The Play That Goes Wrong (touring) Nottingham Theatre Royal. Review: A Chorus Line. Spotlight Theatre Company. Nottingham Playhouse.